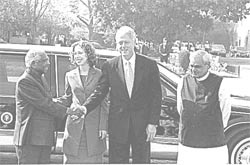 "there are few areas where cooperation is needed more than on the issues of climate change and clean energy," said us President Bill Clinton, addressing a group of environmentalists and journalists at a meeting in Agra during his visit on March 22, 2000. The speech, which also promised to fund a series of energy projects in India, followed the signing of a joint statement on cooperation in energy and environment between Indian minister of external affairs Jaswant Singh and us Secretary of State Madeleine Albright earlier that day. The agreement, under which a joint consultative group on energy and environment will be set up, is the second of its kind in six months. In October 1999, Singh had signed a similar statement on energy and environment with visiting us energy secretary Bill Richardson. This eagerness on part of the us to engage India in energy projects is not without cause. Under the Kyoto Protocol of the un Framework Convention on Climate Change ( fccc ), the us has to show a reduction of its greenhouse gas emissions, mostly carbon dioxide, by seven per cent compared to 1990 levels, by the 2008-2012 period. Despite being the world's largest emitter of greenhouse gases ( ghg ), the us is unwilling to make these reductions domestically. Instead, it wants to make ghg reductions in developing countries under an emissions trading mechanism called the 'clean development mechanism' ( cdm ), which they would then show as their own reductions under the Kyoto Protocol. For instance, if a power plant costs Rs 100 crore, the us will bear the incremental cost of Rs 2-10 crore that it takes India to buy a more efficient power plant from the us with lower greenhouse gas emissions. In this way, the us will 'reduce' emissions in developing countries, and show this as a reduction by the us under the Kyoto Protocol. Naturally, India will have to buy the clean energy technology from the us , making the arrangement even more lucrative for them. Deputy director of the United States Agency for International Development ( usaid) , James A Bever and the us embassy estimate that at a value of us $2.5 billion, the environment market was the third best sector for selling us goods and services in India, after software and telecommunications. But India has led the g- 77 group of developing countries in their opposition to cdm , pointing out that it is nothing but a mechanism for the North to mop up low cost emission reduction possibilities from developing countries. Moreover, it does not address the right of every individual to have equal rights to emit greenhouse gases, and to the Earth's atmosphere. For instance, the ghg emissions of one us citizen with a more energy-intensive lifestyle, equaled those of 19 Indians in 1996 (see Down To Earth, Vol 8, No 21, and Green Politics: Global Environmental Negotiations-1 , published by the Centre for Science and Environment ( cse ), October 1999). An official from the ministry of external affairs, speaking under conditions of anonymity, said that the pressure on India to accept cdm in recent months has been intense. Because the us would have to spend 95 per cent less to meet their commitments with cdm than they would without, they have put pressure on the Indian administration to work towards 'an early agreement' on the Kyoto Protocol in general, and cdm in particular. us interests in winning over India is evident from the number of energy and environment officials that have visited India recently. After energy secretary Bill Richardson, Clinton's visit was preceded by a delegation of high level us officials to clear a path for him and his environmental negotiations. The delegation, led by David Sandalow, assistant secretary, Office of Oceans, International Environment and Scientific Affairs ( oes ), visited individual officials in the ministry of environment and forests and the ministry of external affairs. Sandlow claimed the delegation had 'very friendly discussions with the Indian government' on climate change. Though Indian officials have succeeded in keeping both agreements general, without giving away any firm commitments for unqualified support to cdm , both signal an increasing and dangerous acceptance of the mechanism by India. According to the 1999 agreement signed by Singh and Richardson: "The governments of the United States and India resolve to work closely together with other countries to develop agreed international rules and procedures for the Kyoto Mechanisms, including the Clean Development Mechanism." Meanwhile, according to the more recent agreement, "The two countries intend to work together and with other countries in appropriate multilateral fora toward early agreement on the elements of the Kyoto mechanisms, including the Clean Development Mechanism, which could offer opportunity for mutually beneficial partnership between developed and developing countries. They recognise, in particular, that the Clean Development Mechanism could provide important opportunities for economic growth and environmental protection." These agreements could, therefore, lead down a slippery path of accepting cdm with all its inequities. There are several energy projects planned as part of the new environmental energy cooperation between the us and India. The usaid has committed us $20 million for a three-year extension of a programme to help reduce ghg emissions and another us $25 million to help promote commercialisation of energy efficient technologies and services. This is in addition to India's involvement in usaid 's us $50 million South Asia Regional Initiative ( sari ) Energy Program designed to accelerate investment and trade in clean energy among South Asian nations. The us Export-Import Bank has committed us $200 million for a 'specialised line of credit' targeted for clean energy development projects in India. And in a private sector statement running in the wake of the governmental agreement, the Confederation on Indian Industry ( cii ) and the us Energy Association have agreed to cooperate on trade in clean energy development in India and together announced the creation of a new 'green business centre' in Hyderabad. In his Agra speech, Clinton also said that countries "don't have to choose between economic opportunity and environmental protection", implying that developing countries can take on commitments to reduce their ghg emissions without compromising their development. While this statement contradicts the stance maintained even by the us , where the Senate has refused to take on reductions because they fear it could affect economic growth, even environment-friendly countries like the Netherlands have accepted that economic growth and ghg emissions are closely linked. Scientists in the Netherlands have shown that it can de-link sulphur dioxide emissions from Gross Domestic Product ( gdp , i.e. national wealth), but they have not been able to reduce carbon dioxide emissions without reducing gdp (see Difficult goal ). If industrialised countries are unable to achieve this goal, how can developing countries be expected to bear the weight of it? Clinton made a sly addition aimed at those who claim that economic growth and ghg reduction are inseparable. "There are some people who don't believe that anything can be done about global warming because they don't believe the economy can grow unless energy is used in the same way it has been used for 100 years in industrialised countries," he said. This statement showed a lack of understanding of the Indian position which does not oppose action against global warming. It merely calls upon industrialised countries to take responsibility for the high historical and current per capita emissions, and take domestic action before asking developing countries to do so.